In Falling Upward, Fr. 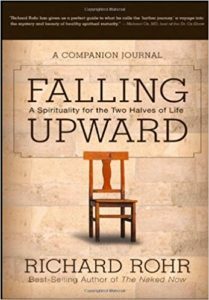 Richard Rohr seeks to help readers understand the tasks of the two halves of life and to show them that those who have fallen, failed, or “gone down” are the only ones who understand “up.” The Companion Journal helps those who have (and those who have not) read Falling Upward to engage more deeply with the questions the book raises. Using a blend of quotes, questions for individual and group reflection, stories, and suggestions for spiritual practices, it provides a wise guide for deepening the spiritual journey. . . at any time of life.